I just had to bring back these Baked Apple Ice Cream Bowls now that fall is upon us! They make you want to say “Wow”! October 2012: Yea. I said the same thing when I saw the final product of these Baked Apple Ice Cream Bowls. I mean…LOOK AT THEM! My inspiration you’re wondering? Well, the fall has gotten me in a weird creative mood with food these days, so I thought, “Why not?” Why not eat ice cream out of a delicious and crisp apple while eating the apple as well? Also, you are still kind of eating healthy. Sure it has butter and sugar but it has more apple in the recipe. Meaning, it must have more nutrients tyour you body needs anyway? You follow? September 2017: Yeah, this recipe was created 5 years ago! I am just as much of a genius as I was then, as I am now. The weather is changing pretty earlier here in Cincinnati. That means it’s still warm but the fall weather is definitely upon us! Shorts are definitely a maybe right now. I come alive when the fall comes because I get into a fall baking mood! It all starts with football season and the tailgating parties. I love making amazing tailgating recipes and that is always the start. The next thing you know is I am making Pumpkin Recipes, Fall Recipes, and Comfort Food recipe! I mean, I am ready to go. One thing I enjoy making are apple recipes. Have you noticed that apples are in abundance at this time of year? And there are all types of apples too! There are Washington apples, Honeycrisp apples, Pink Lady apples, Fiji apples, Pink Lady apples, and so much more. With all of those apples, you are going to need some apple recipes to bake all of those apples. Thi is one of the easiest apple recipes you will come across on my blog. Well, these Baked Apple Ice Cream Bowls and my Grandma Daisy Fried Apples Recipe. Not to mention, I am cooking up more recipes too, with….APPLES! October 2012: Let me tell you, I hadn’t the slightest idea of what I was doing when I came up with this idea. I just knew that I wanted some baked apples and ice cream and with the help of butter and sugar, I was well on my way. Not to mention, Golden Delicious Apples are in season right now and they are the best apples in the world! I honestly feel like Honeycrisp Apples are like candy in the healthy world. They are super sweet and juicy. Going back to the subject at hand, I was thinking about my grandmother and when she use to make fried apples for me as a kid. I guess you can say she kind of inspired the whole thing. Not only that. I thought it would be fun to have something different to hold you ice cream that you can eat too! Anyway, I hope that you like these Baked Apple Ice Cream Bowls. September 2017: I love going back through some of my old recipes and taking note of where I was to where I am now. It is always good to go back, as a food blogger, and bring some of the old recipes back to the forefront. Sure my blog is a catalog of the recipes I want to share with my family, but they are also full of recipes that I know will make you happy and fill your life with joy. The fall season feels me with joy and bag of apples. You and I are going to need some pretty delicious and easy apple recipes to find a place for all of these apples. I mean, I probably could make Homemade Deep Dish Apple Pie every day, but there are some other apple recipes you can make that are on my blog that you will love! For instance, check out these Caramel Apple Blondies that was a big hit! You can also fill your stomach with this Slow Cooker Steel Cut Apple Pie Recipe, that I LOVE!!! That recipe is probably one of my favorites on my entire blog, to be honest. I also have an apple recipe using pork. In my e-book, “I Love You…Let’s Eat” I have a recipe with a thick pork chop with an amazing apple sauce. Whatever the case may be, I want you to think outside of the box when it comes to how to make your apples. These baked apple bowls are the perfect start to any fall season. 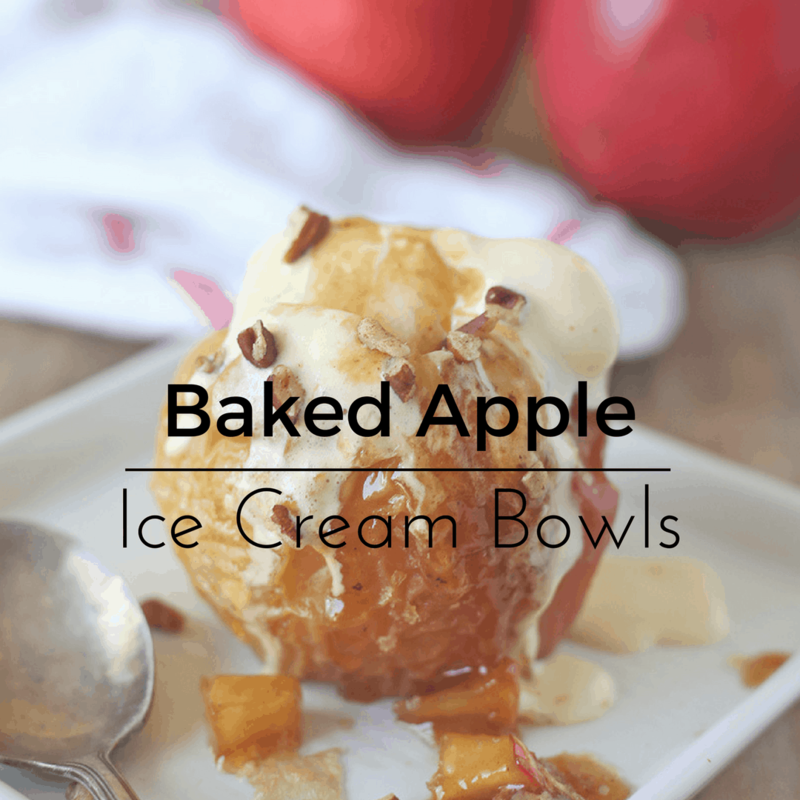 These Baked Apple Ice Cream Bowls is an awesome apple recipe to kick start the fall. Bake some apples and fill with your favorite ice cream flavor! Hollow the apple(s). You can use an apple cord and take a spoon and scoop more of the apple out so it is deep enough to add the ice cream. Or you can take a steak knife and cut a hole inside and use a spoon to scoop out the section of fruit you cut. Take the apples and 4 tbsp. of butter and rub it on the inside and outside of the apples (2 tbsp. a piece). Make sure the apples are dry so the butter can stick to the apple. Mix the brown sugar and cinnamon together in a bowl and rub it on the outside of the apples as well. Bake the apples for 15-20 minutes. The apples will become soft. Set aside and let cool. Take the other 4 tbsp. of butter and melt over medium-high heat. Once the butter has melted add the brown sugar and stir until it has completely dissolved. Add the diced apples and cinnamon. Allow to cook for 5 to 10 minutes or until the apples are translucent. Add vanilla or bourbon and heavy cream. Stir once more for 2 minutes. Set aside and allow to cool, slightly. In your baked apples, add your favorite ice cream, pour over the apple mixture, top with pecan (if desired)and enjoy!